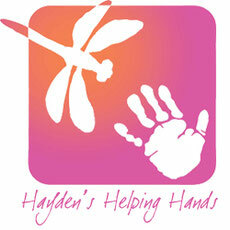 Hayden's Helping Hands is not responsible for the content of the websites listed in our Links section. They are offered because they may provide support and/or information. If you have specific questions or concerns about any of these links, please contact the owner of that site directly. If you find a useful resource that we do not have listed, please let use know. Now I Lay Me Down to Sleep Foundation: (NILMDTS) administers a network of more than 7,000 volunteer photographers in the United States and 25 countries. At a family's request, a NILMDTS Affiliated Photographer will come to your hospital or hospice location and conduct a sensitive and private portrait session. The portraits are then professionally retouched and presented to the families on an archival DVD or CD that can be used to print portraits of their cherished baby. The Dougy Center: provides support in a safe place where children, teens, young adults, and their families grieving a death can share their experiences. We provide support and training locally, nationally and internationally to individuals and organizations seeking to assist children in grief. We are supported solely through private support from individuals, foundations and companies. The Dougy Center does not charge a fee for its services. Brief Encounters: A nonprofit, nonsectarian group for parents whose babies have died before, during, or after birth. Brief Encounters provides meetings in the greater Portland, Oregon area and local phone support. At informal, mutually supportive meetings, bereaved parents and their families share their stories, discuss issues that arise around pregnancy and infant loss, and remember their children. Through talking or just listening, we learn what grief is and how, through understanding and caring, we heal. BabyLoss Eugene: A support organization for parents and others who have been affected by the loss of a child. We offer a safe, nurturing place for those who have experienced pregnancy loss or the loss of an infant or toddler. Transitions Professional Center: End-of-Life, Palliative Care, Loss & Bereavement Psychologists. Their mission is: To ease emotional suffering that is the result of loss associated with death and dying. Psychology services include clinical treatment, assessment, education, and consultation. The TEARS Foundation: The TEARS Foundation is a 501(c)(3) non-profit organization that seeks to compassionately assist bereaved parents with the financial expenses they face in making final arrangements for their precious baby who has died. Many of the founders and volunteers at The TEARS Foundation have experienced the loss of their own baby, and want to reach out in this way to support newly bereaved parents in their time of devastating sorrow.